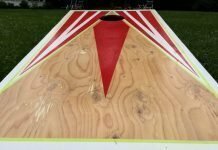 A complete overview of the game of polish horseshoes (aka beersbee), including set up, rules, scoring, drinking variations and more. 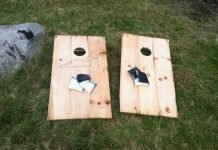 Also known as Beersbee, the game of Polish Horseshoes is perfect for barbeques, days at the beach, campgrounds and more. It’s a fun drinking game to play outside, but families can enjoy this one too. The objective of the game is to throw a frisbee at a bottle that is resting on top of a pole. The other team tries to catch the frisbee and/or bottle to prevent you from scoring points. 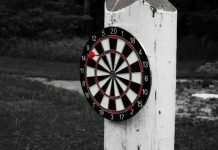 This guide will teach you how to play polish horseshoes, including setup instructions, game rules and additional tips. Polish horseshoes is simple to set up. For a DIY version, all you really need is two poles, a frisbee and a couple beer bottles or cans. But if you want to play frequently and take your set to different venues (i.e. the beach, pool, backyard, etc), it may be worth investing in a ready-made polish horseshoes set. For a proper DIY version of polish horseshoes, you’ll need two poles about 6 feet tall. Some players use shorter poles, but we prefer at least 6 feet or higher. A taller pole makes for better throws and gives the defense more time to catch the bottle when it’s knocked off. Set the poles in the ground about 20 to 40 feet apart. To make your poles more stable, one common method is to use wooden dowels, about a foot high, with pointed ends. Dig each dowel firmly into the ground and then fit your PVC pipes over them. Dig the PVC poles about 1 – 2 inches into the ground. The top of the PVC pipe or other hollow pole should be covered with tape to create a flat and stable platform to set your beer bottle on. 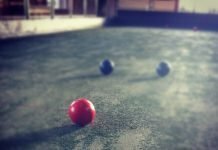 If you’re playing the game of polish horseshoes indoors or outdoors but on a hard surface, you will need to create a base to hold the poles. This is when a polish horseshoes or beersbee set comes in handy (more on this below). You can use any size frisbee disc to play Polish Horseshoes. I prefer using a regulation size 175G frisbee. This makes it easier to throw the disc within a catchable range. It’s also easier for the defense to catch, which makes the game more fun for everyone. Finally, you need an empty bottle or can to place on top of each pole. Keep in mind that if you’re playing on a hard surface, you probably don’t want to use empty glass bottles. The advantage of using a Polish Horseshoes set, such as the one offered by Yardies, is that it is easily portable, perfect for indoors and designed specifically for the game of Polish Horseshoes. Wingman carrying case that holds your game set and has a cooler compartment. Instructions on how to play and how to keep score. The basic goal of Polish horseshoes is to throw a frisbee at a bottle that is resting on top of a pole. Very simple in concept. You can either strike the bottle directly and knock it to the ground, or strike the pole so the bottle falls off. Each player on a side alternates throws while the other side plays defense by trying to catch the frisbee and keeping the bottle from hitting the ground. After two throws, the defense becomes the offense and take their two throws. Only the offense can score in polish horseshoes. The defense tries to prevent them from scoring. If the defense does not catch the frisbee on a catchable throw, the offense gets 1 point. First team to reach 11 or 21 points, depending on what you’re playing to, wins the game. All players must have a drink in one hand at all times. This does not need to be an alcoholic drink. Any beverage will do. Frisbee throws must be “Catchable”. Generally this means that the thrower should not intentionally make the frisbee hard to catch. So, the Frisbee can’t be thrown lower than knee height. The throw should not be too high or too far out of a catchable radius. It cannot hit the ground before the pole. If a throw is not catchable, no points will be awarded. Any player takes a drink if they spill their drink at any time – including diving. Again, the drinking aspect of polish horseshoes is optional. And that’s it. 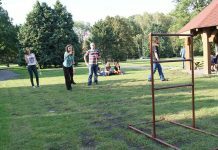 Polish Horseshoes is a fun and challenging yard game. 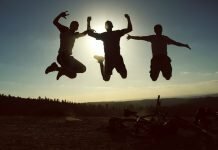 While not technically a ‘bar game’, Polish Horseshoes is a fun and physical game that you can take to the beach, base of a ski mountain (try using ski poles), your local park, or anywhere else where you have the space and the right equipment. If you want a stable and sturdy set of Polish Horseshoes to take anywhere, we recommend the Yardies kit. But there are several other versions out there as well. Or, as mentioned, it’s pretty easy to grab a couple poles and make your own set.